Professor Charles Debatista, in his Carriage of Goods and International Trade classes, would always remind us that the wheel on which all trade, domestic and international, turns is the principle of pacta sunt servanda – that promises must be kept. If I do not have the confidence that you will uphold your end of a bargain, or that there is a reasonably quick recourse for me in the event of your default, there is no logical reason why I should enter into a commercial relationship with you. One of the very first questions intending international investors or their lawyers ask in pre-incorporation due diligence is “Do Nigerian courts uphold agreements freely entered into by Nigerians with non-Nigerian parties?” Typically, the question that would follow is “If yes, how long does it take, on the average, for lawsuits for the enforcement of contracts to be concluded?” It was very easy then, to casually respond that the average lifespan of a suit at the court of first instance is 3-5 years, with appeals to the Court of Appeal and the Supreme Court lasting another 2-3 years each, on the average. The math is hard to ignore, however. You could very easily be in court for 10 years trying to get someone to keep his end of a bargain. And even if you had 10 years to fritter away, there are no guarantees that you would be able to afford to keep paying your lawyer for that long. 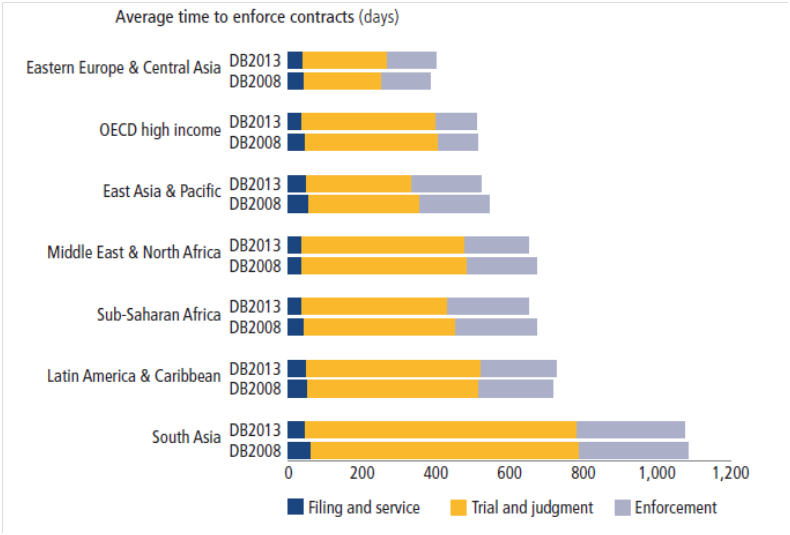 The negative consequences of a judiciary with this speed of enforcing contracts are quite a few. I have previously retold here how an employer dared his expatriate employees to go to court to claim the 6 months’ arrears of salary he was owing them. Even though they had fixed contracts for 2 years, on the basis of which these workers relocated to Nigeria, this employer called their bluff. Unable to afford the cost or time of a trial, one by one they slunk back to their respective countries. However, this was even on a relatively small scale. An investor bringing in, say, $300million dollars wants to know how quickly he can cut or recoup his losses in the event that his Nigerian partners default on their obligations. In addition to anecdotal evidence of the consequences of a slightly sluggish judiciary, empirical studies, as reported here (Doing Business – Enforcing Contracts 2013) and here, show that a judiciary that resolves commercial disputes in a timely and cost efficient manner is crucial to a healthy economy. The studies suggest that “countries with slower judicial systems, on the average, have less bank financing for new investment” and that “financial intermediates are likely to reduce the amount of lending if the ability to collect on debts is no longer given or obtaining control over property as collateral to secure loans is denied.” The latter part of the preceding sentence is evident here in Nigeria, where the consensus amongst small business owners is that it is extremely difficult to obtain affordable finance or credit from banks for their businesses. Speeding up the judicial process will also be critical to resolving at least 2 current front-burner issues – corruption in government and the lack of respect for the Rule of Law. The chairman of the Economic and Financial Crimes Commission was recently reported to have expressed frustration with the ability of high profile (political/government) suspects to delay their trials. His lack of faith in the country’s judiciary is shared by the millions who would rather exact summary justice on suspected robbers or rapists than hand them over to the authorities to be investigated and charged. Speedier prosecutions would lead to many positives. Wrongly accused persons would no longer waste half their lives away in police and prison cells awaiting trial. Public officials would be deterred from stealing public funds because there would be less time to manipulate (or be perceived to be manipulating the system). The confidence of citizens in the judiciary would also be restored. In Nigeria, Lagos State is easily at the forefront of judicial reform, especially with the appointment of judges and the expansion of the jurisdiction of subordinate courts. Lagos State judges are also mandated by current civil procedure rules to encourage parties to a dispute to settle prior to a full hearing. However, courts in Lagos are still very congested, indicating that there still might not be enough judges. We are provided with an idea of what would be an acceptable ratio of judges to the population in this article on litigation and delays in the Indian judiciary. The article reports that as far back as 1987, the country’s Law Commission had recommended a ratio of 107 judges per million citizens. It is instructive that while India was planning (in 1987) to achieve this target by 2000, the USA had already achieved it in 1981. Another piece, also from India, compares India’s judges per 100,000 to the ratio in “well-administered” countries. The information is reproduced in the table below. What, then, is the current ratio of judges to Nigerian citizens? I spent over an hour trawling through various judiciary websites and even the site of the National Statistics Bureau, with no luck finding out the number of judges (including customary court judges and magistrates) that we currently have in Nigeria. But, making assumptions, on the premises explained below, I reckon we have about 4,000 -5,000 “judges” at the very maximum. The Supreme Court currently has fewer than 15 justices out of a constitutional maximum of 21 but let us assume a full court. There are currently roughly 70 justices of the court of the court of appeal but let us assume a bloated estimate of 100 judges for both courts. There are also roughly 70 judges of the Federal High Court. Each state has a State High Court. If we use Lagos as a benchmark, with roughly 50 judges per State (an unreasonably high estimate given that there will be several States nowhere near as busy as Lagos, but you’ll soon see where I’m going with this), that is 1850 state High Court judges for all the states and Abuja. This gives a total figure of 2,020 judges. If we then doubled the figure to accommodate judges of the National Industrial Court, judges of the customary court and the customary court of appeal, as well as magistrates, we would have an estimate of roughly 4,000. Thus, even if we assumed a figure of 5,000 judges for a population of 160 million people, the ratio is 31 judges per million individuals (or 3.1 per 100,000), approximately a third of the Indian and American ‘optimum’. The argument for more judges however, needs to be counter-balanced with the need to ensure that the integrity (not in the context of ‘honesty’ – see speech here where the former Chief Judge of Nigeria remarks that expanding the size of the Court of Appeal has led to conflicting judgements) of the system isn’t compromised or lost. I realise that the references from which my conclusions concerning the judiciary have been drawn were primarily focused on civil proceedings but I see no reason why the same measures cannot be applied to the congestion in the criminal justice system as well. I realise too, however, that the criminal justice system also includes the police. On police reforms, I will again refer readers to the most comprehensive discussion of which I’m aware on the subject, here. The government has taken many measures to convince foreign investors that Nigeria is a good destination for their money. The Minister of Trade has introduced accelerated the process for obtaining business visas, while the Minister of Aviation also recently announced an investment road-show. The government can give as many assurances as it wishes but it is clear that reducing the speed at which the wheels of the judiciary roll will be one of the most significant steps that will be taken. Nice one. What about ADR (Alternative Dispute Resolution)? I think most companies don’t take their matters to court anymore. What they do is to go to ADR. I think that is a better approach. It saves time, promotes a win-win situation and protects the name of the parties. I considered ADR (in respect of which Lagos operates a MultiDoor Courthouse). In Law School, they tell us that it’s cheaper, but I’ve come to be of the opinion that it’s only cheaper in the context of time saved. Arbitrators’ fees are quite high when compared with lawyers’ fees plus court costs. Well researched and written piece. I’ve handled a few Arbitration matters and while I agree the fees are relatively higher, I believe the juice is worth the squeeze. Especially if you’re involved in a multi million dollar transaction and would rather spend 3 months as opposed to 3 years to get a decision. My experience on that regard is that the choice of law (and forum) will ultimately determine how quickly the Arbitration route will resolve disputes. I am yet to see a wholly Nigerian arbitration that the award was treated by the losing party as final and binding. More often than not, depending on what’s at stake, the award will go through appeal from the High Court to the Supreme Court. However, grounds for setting aside an arbitral award in, for example, the UK are much more limited. Enjoyed reading this. Shows how things we may not realize are connected beneath the surface. Nicely written too. Still waiting on Nepa and roads and petrol and internet tho. Thanks for the kind words. It does seem, the more we look at the issues, that everything is connected to almost everything else. Alarming that almost every component of the system is in a state!